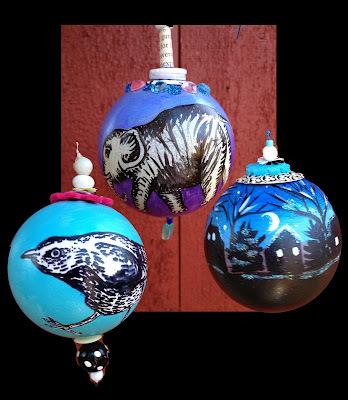 These are ornaments I am having so much fun painting and embellishing - join in the fun making these or decorate plates at the North River Arts society next Thursday- you do not need to be worried about whether or not you are an artist- its all about fun! I will have glitter on hand, and all over me as well! Bring your creative spirit as we decoupage and paint plates to keep or to give as gifts. These are heavy plastic "chargers', and will be sanded and primed for you ahead of time. We will provide materials for decorating, but if you have anything special, please feel free to share!